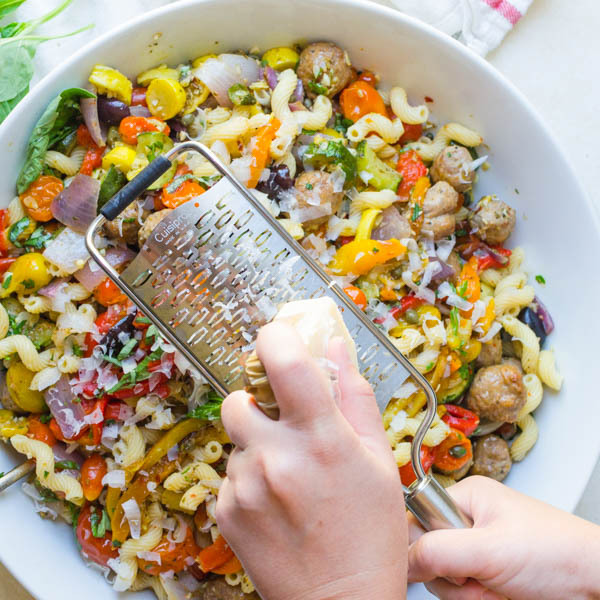 Here’s an easy pasta dish that will satisfy everyone’s appetite, a sheet pan sausage, vegetable and pasta wonder that doesn’t need a fancy sauce to make it sing. 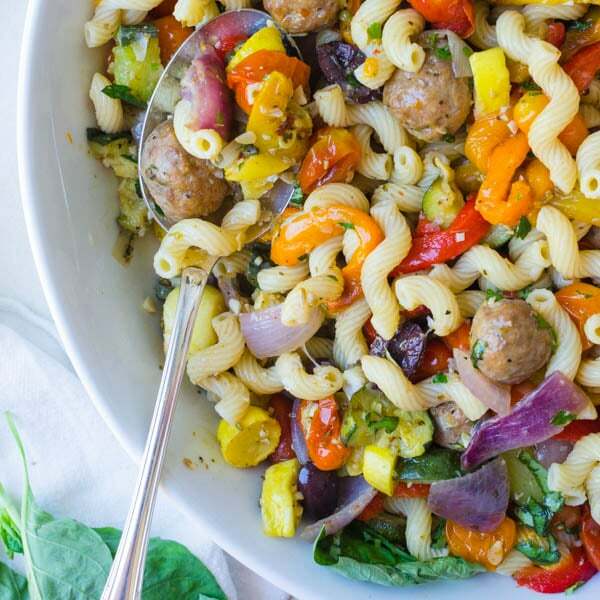 This Italian roasted vegetable and sausage pasta is brimming with garden fresh vegetables, savory Italian sausage, garlic, briny bits and fragrant herbs for a savory, satisfying meal you’ll make again and again. This post has been updated for content since its first publication. 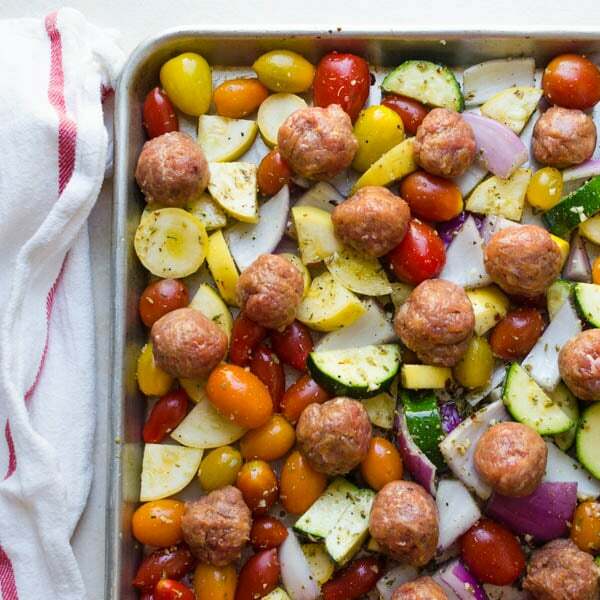 If easy dinner prep is your thing, you’ll appreciate this sheet pan sausage and vegetable medley. 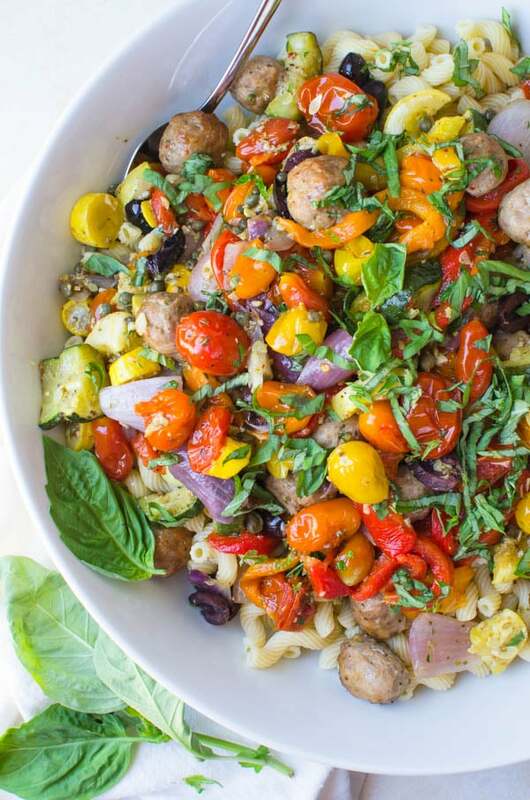 Seasoned summer squash, peppers, zucchini, and onions roasted with bites of Italian sausage (you can use hot or mild) tossed with hot pasta and seasoned with olives, capers and a bevy of fresh herbs. It’s got a little bit of something for everyone and the oven does most of the work. The sweet vegetables and sausage are just the tipping point. 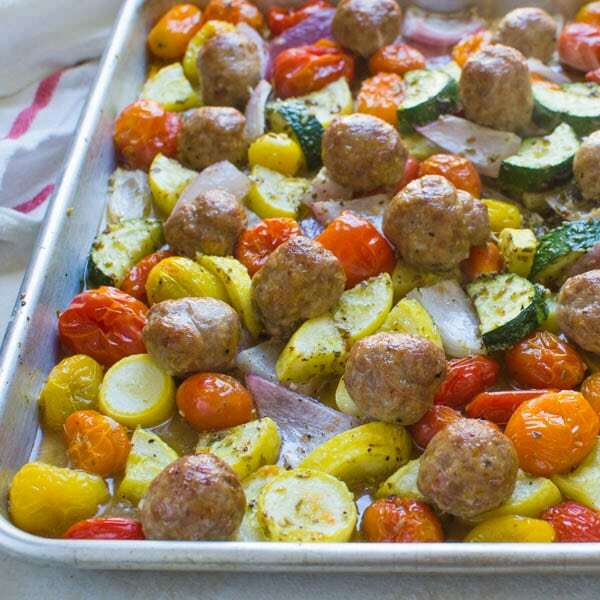 To really make this sheet pan sausage and vegetable dish, you need some in-your-face seasonings. Not your standard wall-flower sprinkling of Mrs. Dash seasoning, but instead a heavy handed blend of dried herbs and spices. Bite sized chunks of Italian sausage gets added to the mix and as the vegetables and sausage roasts, the sausage renders some of its fat and the tomatoes split and leak their juices, creating a tempting saucy coating that makes this easy pasta dish with Italian roasted vegetables, so mouthwateringly good. 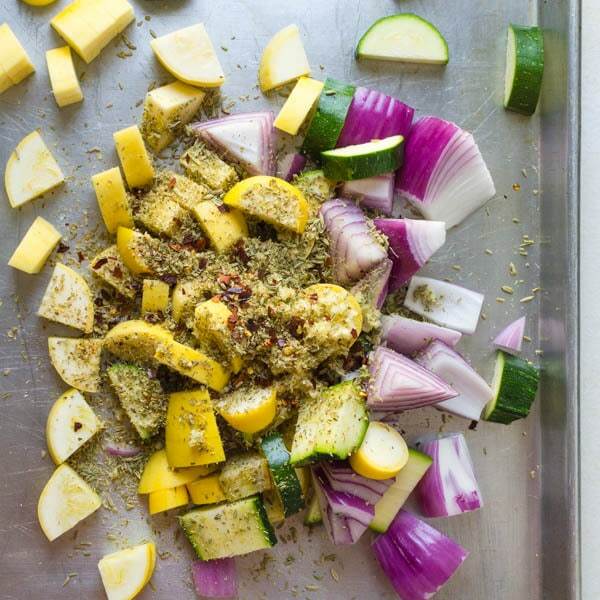 What’s In The Spice Blend For Roasted Vegetables? I have to be honest, I never used to like fennel. I always found it strong and overpowering, but I tried some in a pasta sauce at a local restaurant and that sauce changed my mind. I’ve even sought it out as an ingredient in my plank grilled salmon. Since then, the taste of fennel has grown on me and the anise flavor plays really well in this easy pasta dish. 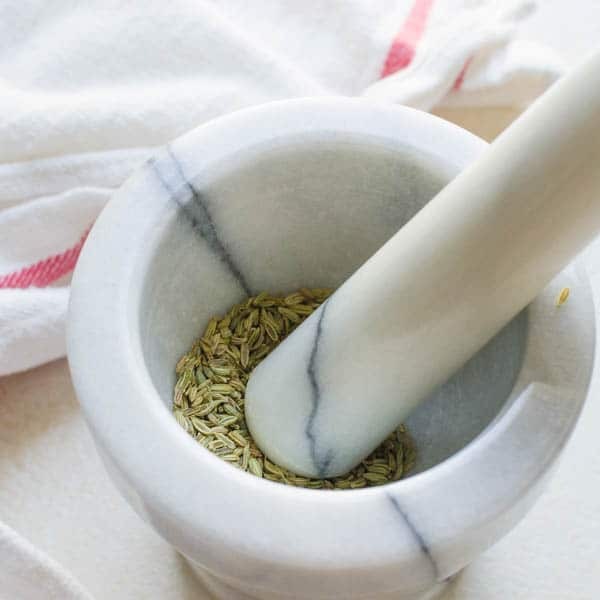 Crush the fennel seeds in a mortar and pestle before adding them to the veggies so the flavor really develops. Toss the fennel, garlic, crushed red pepper and dried herbs over the vegetables and toss them with a liberal dose of olive oil. So far, so good, right? Then comes the sausage. I like spicy Italian sausage for this recipe, but if you prefer less heat, then by all means use a milder Italian sausage or for an even healthier bent, use Italian turkey sausage for the flavor without the extra calories. The Italian sausage that I buy typically comes in large links. Instead of chopping the sausage with the casing, I run a sharp knife vertically down each link and remove the casings. Then, pinch off a bite sized chunk and roll it into a little meatball. (rolling the sausage is a great task for pint-sized helpers). 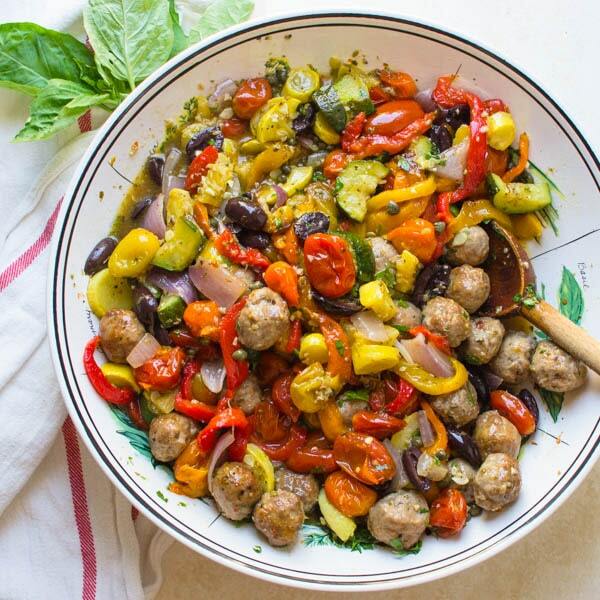 Evenly spread the meatballs around the vegetables to roast. The skins of the bell peppers are tough and papery and maybe it’s me, but they always seem to get stuck in my throat. They’re much better when roasted whole. Place the peppers in a hot oven. Roast until the outside is puffed and blackened and the flesh is soft. 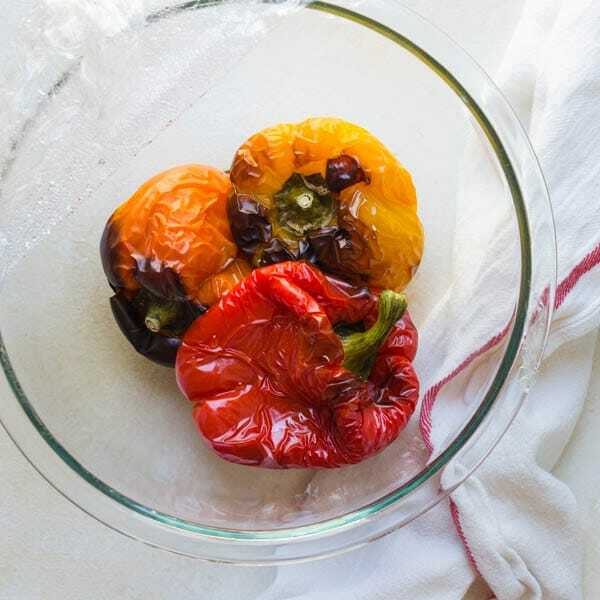 Transfer the roasted peppers to a small bowl and cover with plastic wrap. Let the peppers cool until they’re soft enough to handle. Peel the skins (they come off so easily) and remove the core and seeds. 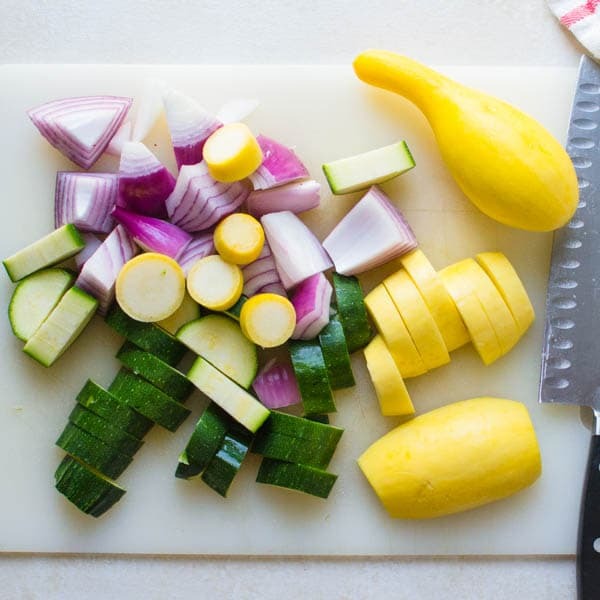 When the Italian roasted vegetables are done, mix the pepper strips in with them — and if there’s any juices left in the bowl, they can be mixed in with the rest of the veg. When the roasted vegetables are done, assemble the rest of the dish. I like to use a large, wide pasta bowl for this, because it makes a lot and it’s easier to toss the ingredients together with a wider dish rather than a deep one. 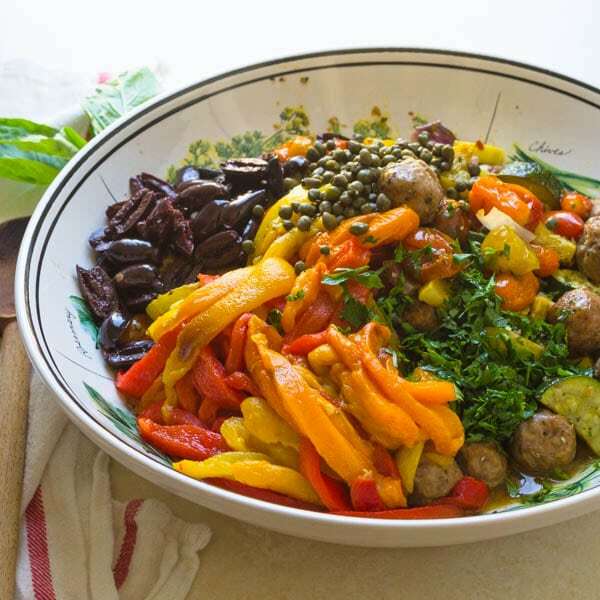 Add Kalamata olives, capers and fresh herbs to the sheet pan sausage and roasted vegetables and toss well to combine. The combination should be a bit slick with pan juices, but if you need to add a few teaspoons of olive oil, that’s ok.
Toss until well combined and add the cooked pasta. 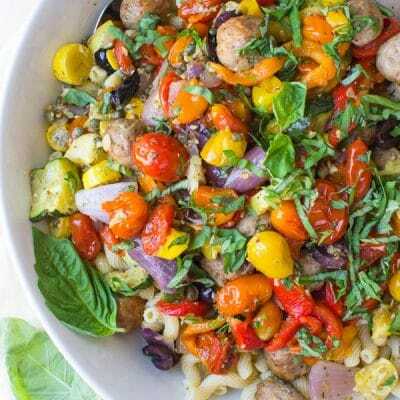 Though this looks like a sauceless pasta recipe, the juices given off by roasting the vegetables and sausage actually moisten and coat the pasta. If you feel it needs more, just add a few tablespoons of chicken or vegetable broth – or even a bit of the pasta water. 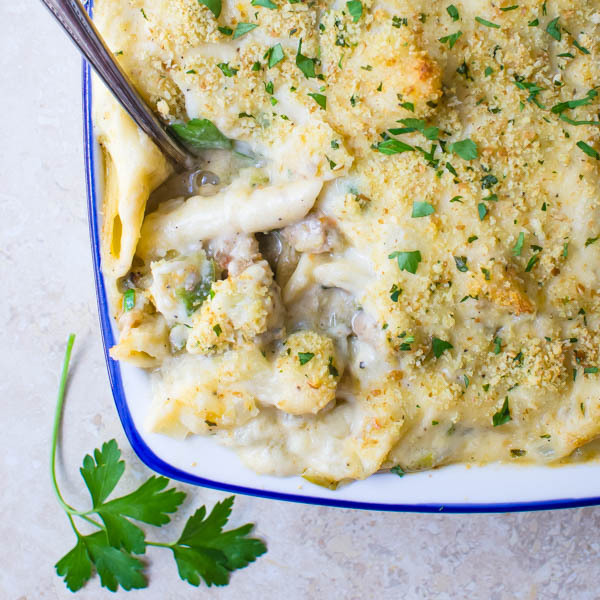 A few fresh shaves of parmigiano reggiano or grana padana would be a delicious final touch to this easy pasta dinner. Now pour some wine and enjoy! If you love sauceless pasta, also try Italian Sausage with Pasta and Sun Dried Tomatoes. 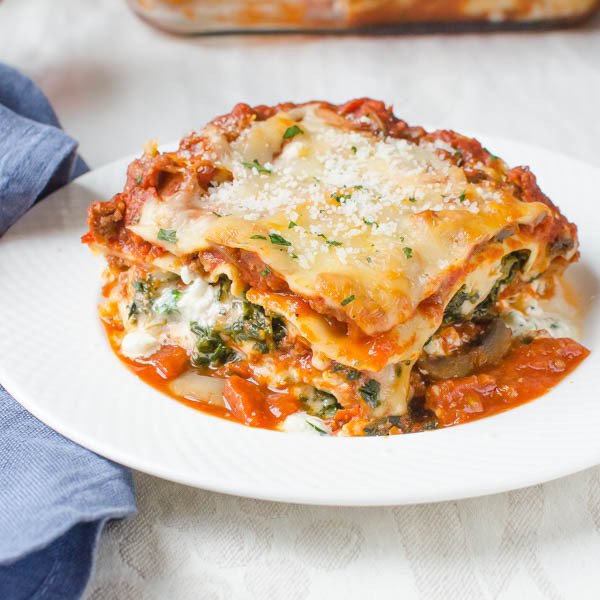 Hearty, savory, meaty and 100% satisfying! Place bell peppers into oven and cook until skin is papery and blackened, about 35-45 minutes. Remove and transfer peppers to a bowl. Cover with plastic wrap and let the peppers steam in the bowl. While vegetables are roasting, prepare the pasta and cook until al dente. Rinse with cool water to stop the cooking process and drain. Set aside. When the peppers are cool enough to handle, remove the skins, stems and seeds and cut the peppers into thin strips. Transfer peppers to a large bowl. Add the roasted vegetables and sausage to the peppers. Scrape the pan to get all of the juicy goodness into the bowl. Add the olives, capers and red wine vinegar. Toss to combine. 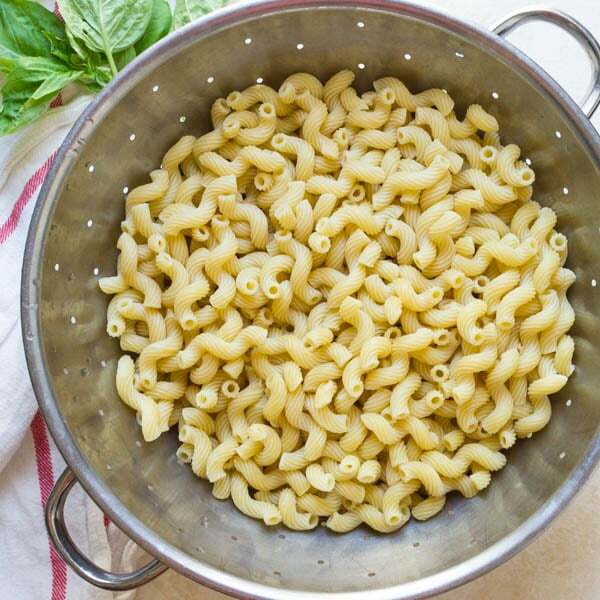 Transfer the pasta to a large serving bowl. Top with the vegetables and all the juices. Sprinkle with fresh basil and parsley. Serve. This reminds me of the latest Bon Appetit podcast, I love the colors! Saving this, I don’t have a good Summer pasta recipe, this looks fantastic. What a fantastic way to use the bounty of summer vegetables! So flavourful and colourful. Love the briny taste of olives and capers too. Thanks for sharing. This is seriously the perfect way to use up those fast-growing veggies. I absolutely hate food waste. It makes me cringe! So making quick use like this is awesome. Thanks, Dana! I don’t like to waste food either. Hope you enjoy. 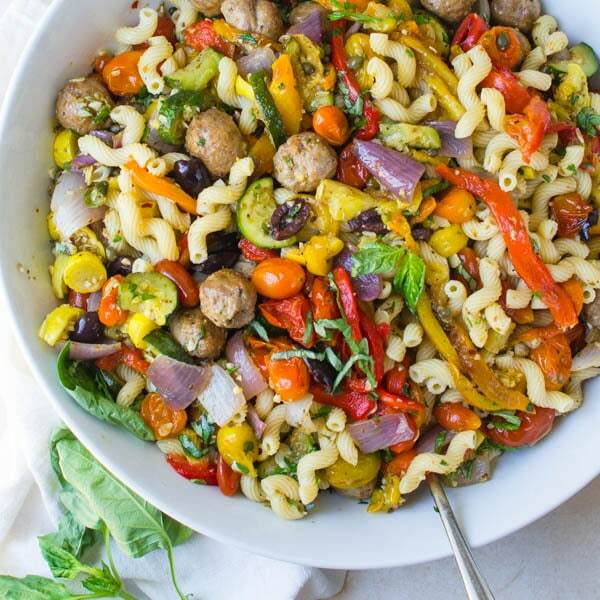 I love bringing pasta salads to gatherings, and this one looks so much healthier than most! I love all of the yummy veggies you have going on in here! Not so much a pasta salad — as it’s served hot, but definitely good for a gathering as it feeds a lot of people. I saw your recipe through blogher lovely looking pictures.